June 3, 2014 - Third-party logistics provider Kane Is Able, Inc. (KANE -- www.kaneisable.com) announced today that it is expanding its transportation fleet with seven compressed natural gas (CNG)-powered trucks manufactured by Volvo Trucks. The commitment to fuel-efficient CNG-powered trucks is an important part of KANE's sustainability initiative to reduce costs and minimize its carbon footprint. KANE's new CNG-powered trucks are being manufactured by Volvo Trucks at the New River Valley assembly plant in Dublin, Virginia. The Volvo VNL daycab models feature a 12-liter Cummins-Westport ISX12 G engine, and are designed to have excellent maneuverability. Each truck's range is approximately 425 miles between fueling. Due to its abundant supply, domestically produced natural gas is less expensive and cleaner burning than other fossil fuels. The CNG-powered vehicles will produce up to 20 percent fewer greenhouse gas emissions and significantly less smog-producing pollutants than their petroleum-fueled counterparts. Advances in vehicle technology now make it feasible to use CNG-powered commercial trucks for long hauls and in the mountainous terrain of the northeastern and western states. 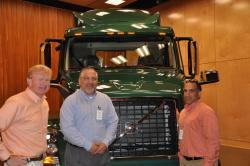 A team of KANE officials recently visited Volvo's Dublin plant for a review of the trucks while they are in assembly. The team included Chris Kane, Mike Albert, senior vice president of operations, Larry Catanzaro, director of transportation (shown left to right), and Alex Stark, director of marketing. "KANE has a long-standing commitment to sustainable operations," said Pete Westermann, president and CEO of KANE. 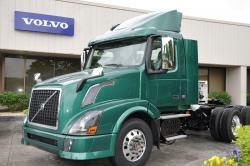 "Volvo Trucks is an acknowledged industry leader in natural gas-powered vehicle technology. Adding these natural gas trucks to our fleet makes good fiscal and environmental sense." Delivery of the trucks is expected by August. KANE manages 21 distribution centers across the United States, and operates more than 200 power units in its fleet. The CNG-powered trucks will operate out of KANE's Scranton, Pennsylvania, business campus. Volvo Trucks is part of the Volvo Group, one of the world's leading manufacturers of trucks, buses, construction equipment, and marine and industrial engines. The Volvo VNM, VNL, VNX, VHD and VAH trucks are assembled in the United States at the New River Valley Plant in Dublin, Virginia, while Volvo engines for North America are assembled in Hagerstown, Maryland. The New River Valley Plant is certified to ISO50001 energy standards. Both plants are certified to ISO14001 environmental and ISO9001 quality standards. Visit Volvo Trucks at www.volvotrucks.com.